This entry was posted in Musings and tagged ban, banning, bloodbraid, bloodbraid elf, chapin, mtg, patrick chapin, standard, t2, tournament, video, wizards, wizards of the coast, wotc. Bookmark the permalink. I think you have to clarify. What’s “to this degree” mean? Because there are historically worse decks. That’s a misleading queston because I don’t think pointing at numbers can actually quantify it. It seems very subjective to begin with. I could argue for banning BBE if Jund had NO counter to it at all. If that were the case, the format surely would be broken and an utter failure. But it’s not true. So even if the format is unfairly skewed in Jund’s favor, that’s not reason enough to ban any of its card pool. Having a dominant deck is a natural state for Standard. Having to design all other decks to beat the dominant one is also natural. There is nothing wrong about this. The fact there aren’t several equally powerful decks IS kind of lamentable, but T2’s card pool is too small. And for whatever reason, WotC R&D hasn’t been properly balancing it. (It was so obvious to me, even before Prerelease, that Reborn’s Cascade spells all favored Jund too heavily. Faeries is another ridiculous example.) Conclusion: FFL is utter fail. Back to topic, even in this season, we have seen a deck that clearly loses to Jund win a 5K (Vampires) because of the Rock-Paper-Scissors effect of the RWU Control deck. More recently, a mono-red deck won GPKL. He made the absolute right choice for the metagame, and he won as a reward. This is an indication to me that the format is still operating. There is STILL a metagame that is not degenerate. Anyway thanks for your blogpost on the matter. I like that you make posts like this because it opens up discussion. 🙂 Less whining, more talking. I’m always for it. By “to this degree,” I mean to the degree that it takes up 30% of the field. Also, just because there’s a historical precedent, doesn’t mean that it’s okay. We likely have a different definition of degenerate. To me, when the deck takes up 30% of the field, that is a degenerate format. Just because other decks are winning, doesn’t justify it to me. The win percentage of the deck is irrelevant to my argument. The power of the card is only relevant in that it affects the amount that the card, and the deck, displayed. You might even say that the fact that it is an uncommon has just as much of an effect. IMHO i’ve always thought of ‘metagaming’ as a myth, an all-pervasive and misleading myth. that kid who won with vampires didnt metagame awesomely, he took a pretty bad deck to a 5k and won; im fairly sure he wasnt the only kid with vampires, so it’s either he did better metagaming with his generic vamp build or the other people did bad metagaming with their generic vamp build; same goes for the BRDW, it had an awesome (awesome!) pilot, and it’s a good deck, and im somewhat confidant that he wasnt the only one with RDW or BRDW, so i wouldnt say he metagamed better than others with the same deck. by that i mean, i could buy the rock-paper-scissors argument if something was actually paper to jund’s rock; but, what, WUR control should still handle it or something, but just flat out lose to everything else. if the worst matchup jund will have is WW and RDW, where it is something like a 45/55% underdog, and those decks eat it hard to some other decks like really hard, i dont see rock-paper-scissors; i see jund just flat out being the best deck, and that has so hampered deck creation and viability that T2 just isnt much fun; it might be awesome that a budget deck is the reigning bully in T2, but there’s just not any variety. and i’m with joe that the problem is BBE; not thrinax or blightning but BBE and how well he fits into jund; its not like the fact that he could be put in naya and naya’s not as awesome so BBE isnt broken, its like, i could’ve put bitterblossom in any black deck but it was only busted and unfun in faeries. maybe people just need to really start hating out jund and stop playing naya, UW control, vamps, any other midrangey deck, but again that means that jund is so warping the format that many otherwise playable decks arent playable. who wants that? and if we dont avoid the fun, original decks that lose to jund, then we have 6 jund in a top 8 and 35% of a tournament jund. I don’t think Bloodbraid elf is a problem. Yes Jund takes up a lot of the tournament field. Is it as dominant as faeries? No way. Is it as obnoxious to play against? Nope. A lot of people play it because it’s good, and most of the cards are commons and uncommons. It’s cheap to play, save maelstrom pulse. It’s proven and easy. It’s no broken by any means. And it rotates out this fall, so just wait it out. The complaining about BBE is getting tiresome. Thanks for the comments. Your first paragraph is mostly subjective. Mainly, how do you define dominant? Because while Faeries may have won more tournaments (one definition of dominant), Jund is much more prevalent than Faeries (another definition of dominant). Again, my arguments are not based on the strength of the card at all, only on the sheer amount that the Jund deck is played. BBE is the enabler in the Jund deck; therefore, it takes the majority of the heat. And in my opinion, Jund is definitely more obnoxious to play against than Faeries. That’s just my opinion, of course. As far as the complaining getting tiresome, well, constantly seeing Jund is pretty damn tiresome too 🙂 More tiresome, really, since it’s been going on longer than the complaining (naturally, since people couldn’t complain about it BEFORE it happened). Yes, the problem with Bloodbraid Elf is all about context. If the Jund deck didn’t exist, I don’t think people would be complaining about it so much (similar to what moose said). But the fact is, Jund does exist, and BBE is the primary piece of what makes the deck so strong. My argument about Jund being more common is that it is cheaper to play than the fae were. Jund is affordable for the pro and the casual player alike. Aside from pulse, the only rares are siege-gang (which is what, $2?) 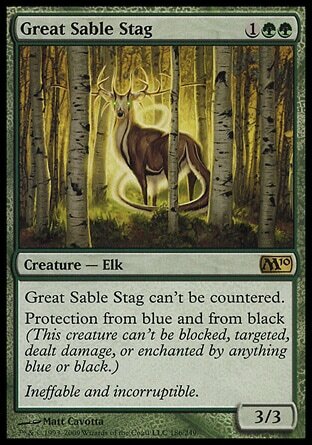 and maybe great sable stag and some lands… but even those you can substitute with any of the tap lands. It’s just easier to get ahold of, and its really good, so a lot of people play it. Jund was able to be played when faeries was a deck before lorwyn rotated, and barely anyone played it, because it wasn’t nearly as strong as Faeries or UW lark or Doran rock. All of your comments are entirely correct, Dan. It’s pretty clear WHY people play Jund so much. It can perform well without needing as much skill (but performs much better in the hands of someone who has a lot of skill), and the cards are easier to come by. But how does this affect the issue of taking variety out of the game? And yes, Jund was not as strong in the pre-Zendikar metagame. But again, context. We’re talking about the current metagame, of which Jund makes up 30-35%. However, that doesn’t mean the metagame is degenerate. Just b/c the metagame only has room for one Vampires deck or one RDW in the top 8 – doesn’t mean that people shouldn’t play it. But RDW wants to wax b/c it beats Jund. So there’s still this -tension- there. The fact that RDW loses to a bunch of other decks? Risk that X% of ppl at any tournament are willing to take. X may be small, but it’s not negligible. And that’s why there’s a metagame. Jund balances itself out, too – because the more Jund there is at a tournament, the more the matchups become a coin flip. So there’s little incentive for the MAJORITY of ppl to play Jund b/c the matchups start to depend less on skill, more on coin flips. so jund is pretty stable at like, 30-40% of the metagame. it might even go higher at some point but it doesnt seem like the best plan to over-saturate b/c of above reason. i would say, considering that the metagame only has room for one vampires in all of it’s top 8’s, that no one should play it. i mean, i just don’t understand why people play decks that lose to jund horribly; or, i do! vamps is a fun deck to play with and it’s rewarding to play a deck that you invest in and agonize over the card choices of, and to h*ll if it loses to jund- and then you take it to a tourney and lose to jund, rinse, repeat. any incentive to play with a non-jund deck, be it because jund *only* is 30% of the metagame, is mitigated by the incentive to play jund, which is the best deck. jund seems to have stabilized at 30-40% because that seems to be the high watermark, i would think, not because people are afraid of the nigh-coinflip mirror match. as long as people insist on playing decks like chapin UW and naya and vamps that just lose to jund then people will continue to play jund and win. when will the metagame be kind to a deck that loses to at least 30% of the field? result? people play jund and bank on what, sideboard and play skill to beat the mirror, since they absolutely crush the field (save like WW and RDW). i would venture most pro’s would rather rely on skill, sb and extensive playtesting for a mirror match and obliterate the field than play a deck that loses to the field and hopes to dodge bad matchup’s. i know how skill intensive the jund mirror is, and i, apparently unlike other people, enjoy watching the jund-on-jund (sounds dirty) mirror, but not when thats like all i see in a top 8 ever. the incentive isn’t to not saturate the market because of fear of the mirror, it’s to bring the best deck and beat the mirror. i mean, who would intentionally not bring the best deck to a tournament that you plan on winning? i have my GW homebrews and such and i bring those to 5k’s, but thats an emotional attachment and i know my deck isn’t going to beat jund 4x to win. 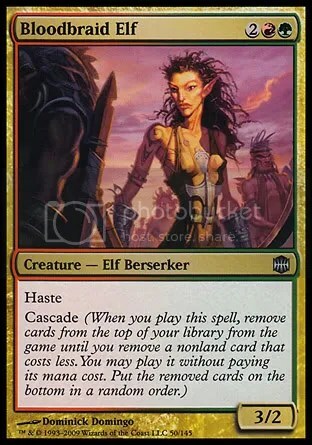 jund is wildly optimal and customizable, and if more people start bringing RDW and WW then jund will adapt and fix itself- you remember when everyone tried to attack jund’s mana and then it just fixed itself?